We are off on an doodle-tastic adventure today – I hope you are ready to have some fun! 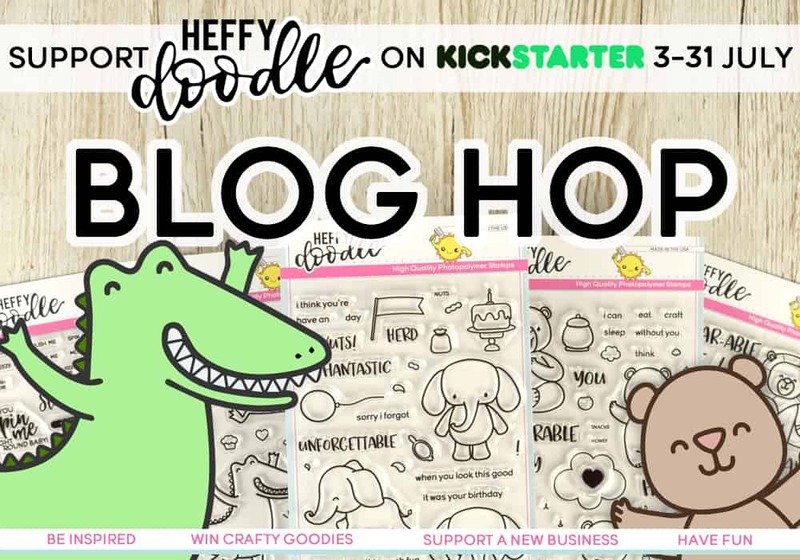 That’s right, we are having a mega blog hop so you can see lots of our Heffy Doodle products in action. We have teamed up with some serious talent to ensure that you see a range of ways that you can use these great stamps and dies. Snow has used the bears from the Unbearable Without You set, and not only do they look adorable together, but they look like they are in their element because they are surrounded by craft supplies! But that’s not all… take a look at this! I love that she has added the SPIN ME image from Interactively Yours at the top of the card, but it is so dainty and subtle. LOVE! Leave a comment on each blog post to be in with a chance to WIN! Comments will remain open until 12 noon BST on 20th July and the winner will be announced on 22nd July here on the Heffy Doodle Blog. WIN!! The winner will win a Heffy Doodle cotton tote and a set of 12 Distress Oxides. Let’s have a look at the line up for our Blog Hop! So that means that the next stop along the way is the awesome NICHOL! We hope that you will support Heffy Doodle and don’t forget to check us out over on all the usual social media channels. You can also sign up for our mailing list here. Congratulations on your new adventure and I hope it is everything you wish for and more!! Love this card from Snow. It’s so very cute and clever. Can’t wait to get my hands on these stampy treasures. How fun! I’m brand new to Heffy Doodle (cool name, by the way!) and look forward to hopping. Love the “Interactively Yours”stamp set – so perfect! these are absolutely punny. I can’t wait to get some of your stamp sets. I wish you the best of luck. Darling little card! Best wishes to Lesley and company!!! Very adorable set of stamps and dies. Love that they work together. Congratulations to you and the very best of luck! I am thrilled to be here from the start. I can’t wait to order some of your great stamps. Thank you. I am so excited about this blog hop! I upgraded my pledge on kickstarter! I realize I need the entire release! September cant come fast enough! Congratulations on your new business venture! I am so excited for you and can’t wait to order some of your stamps. They’re so cute! Thank you. Cute card. I can’t wait to see more. So excited for you on your new adventure. All the best. I Love these stamp sets and love the spinner card. Now the hardest part is having to wait until the stamps are made and get shipped out lol. Best of Luck with your new venture. Love the idea of the wheel with all the petite crafting tools. Thanks! What an amazing card! I’m excited to see what else is on the hop! Awww! Those bears are sooo cute!! 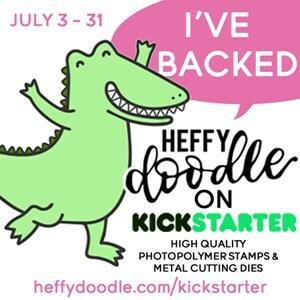 So happy for Heffy Doodle stamps and dies ! Garrett designs Lesley!!! Love Snow’s spinner card! Looking forward to the hop! And some fabulous prizes, would love to win especially since the draw date is on my birthday. So happy for Heffy Doodle stamps and dies!! Grrreat designs Lesley! These are so cute, welcome to the stamping community! Good luck with you new products! Love and Luck for much Success Heffy Doodle!!! I really like the fun puns included with each stamp set. They make me smile! Congrats on your first launch. Such cute images! Good luck on your new line, and such a great blog hop with wonderful inspiration! Congratulations on your new company! I can’t wait to get the stamp sets. I am so excited about your stamps and dies and always happy to back new businesses. The stamp so super cute and I can see so many ways to use them in my crafting. Welcome to the craft world HEEFY STAMPS ! I’m so excited to watch and help you grow up. OH MY GOODNESS ! You are so new I called you by the wrong name…WELCOME HEFFY DOODLE…with love. Really fun new ideas and stamps. Best wishes for your success. Oh wow I love that interactive card, it looks like they are choosing their favourite craft items to craft with. Congrats Lesley! I wish you much love &a success on your new journey! Love the new stamps, can’t wait to get mine! I am loving these stamps – so very cute! And that spinner card is wonderful! Good luck, your designs are so cute! I just finished up the hop and had a ball. What fun, punny, and cheesy joy! Best of luck on your endeavor. Congrats on starting a new business, your designs are so sweet and I’ve loved all the projects on the hop! Love the stamps. My birthday is tomorrow and that would make a great birthday present to me. Looking forward to your collections. Really excited. Everything made with your stamps look so cute! Still have not decided witch stamps sets i want to buy so yay! for this inspiration blog hop. Love your new company. Your stamps are so cute. Good Luck in your new venture. I am sure with the support of such great crafters in your blog hop you will do really well. Such cute stamps and card! Very. Cute stamps and dies. I usually don’t care for cute stamps. But I do like yours. The elephant is adorable. I like all the craft supplies stamps that come with the bears. Good luck with your blue endeavors. I love that snappy croc set. Hope to win–distress oxides aren’t presently in the budget. Fabulous card and so cute and adorable…congratulations on your new adventure and the best to you!! Oh my gosh this blog hop was awesome. Your images are awesome and great designers showing your products. Good luck in your adventure and congratulations on a fun filled business. I love what you are creating. Great interactive fun images. I’m so excited for these stamps, I can’t wait to receive mine! Congrats! love that you are having a reveal, and thanks for the opportunity to win a prize. So cute! Congrats on your new business. Can’t wait to learn more about it, how you chose the name, logo, etc. LOVE the spin right around baby card!! I joined the kick starter and can’t wait to pick my set. I have not jumped on the oxide ban wagon so thanks for the chance to win a set and who wouldn’t love a new tote!! Yay! Your dream is coming true! And we get to enjoy the results! What a fabulous card by Snow and looking forward to the hop! Very cute stamp sets. Love the puns! I wish you luck with your new venture. Very cute critter stamp sets and the Interactively yours set seems super handy!Congratulations on your new adventure!Best of luck! Love your stamps. Good luck on your new business! You diffently have a amusing line up of stamps. Keep it coming. I am sure it will be a successful adventure. How every exciting! Thanks for having this Hop, I will browse around and learn about your company. What a darling card! Love all those crafty tools and the sweet bears! 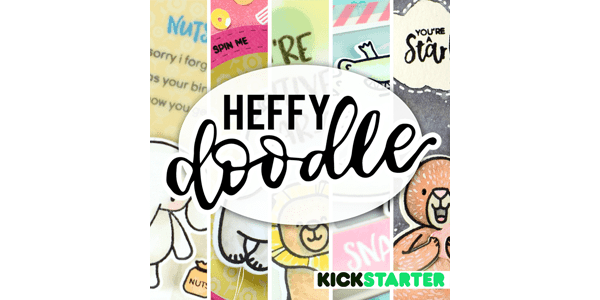 Looking forward to learning a lot more about Heffy Doodle and seeing more to come! Congratulations on your endeavors! Love the new stamps, especially the crocodiles! Cute sets. Best of luck on your business. Congrats!!! Your stamps are adorable!!! Love your interactive card, it’s so cute. Best of luck on you’re business. This is going to be an amazing start so beautiful with so many creations to be done with each set so far. Love, love, love your stamp sets! Best of luck in your business. You are off to a great start with these adorable sets. The interactive set is the perfect addition to any stamper!!! Thanks. Good Luck Heffy Doodle. I look forward to seeing what other cute stamp sets you come out with in the future. An amazing start to the Blog Hop. Great line up! Snow’s been teasing us with this card and it’s good to see the final finished card! Here’s to a successful start up! Very happy to see a new company appear on the market, your stamp sets look really cute! Snow’s card is adorable (as all of her cards are! ), and made me smile 🙂 Thanks so much for the chance to win! Love your stamps. Your card is brilliant. Good luck for the future. Congratulations on a great start with this fun release! Your stamps are very sweet and I wish you much success. The interactive card is simply adorable! Yay! A new stamp company….I’m so very excited. Love your preview release here and can’t wait to see your entire product line. Wishing you the very best and much success! Congrats on starting a new company. Love this interactive crafty card–the bears are so cute. What a very cute card! I LOVE the stamp sets I have seen so far. I am hoping all the best for your new company! Really cute card and clever use of the crafting elements. Best of luck. Congratulations on your new company! Your new release is wonderful! This is such a cute release, I want it all !! Congrats! I love to see new craft business open. Best of everything to you! So excited for your products. Glad to help out on your Kickstarter campaign. Everything is so cute. Congrats on starting off with a bang on Kickstarter with all your cute new goodies!! Love the spinner!! IRRELEPHANT is my favorite sentiment of all time!! What an awesome start for your products! Mind blown away at how much more has been pledged than was requested! Just goes to show that there are tons of Crafter’s who know a good thing when they see it! I wish I could pledge even a little bit but with prescription costs so dang high I am lucky that I am able to pay attention! I know that you are going to be around for a long time because your stamps are totally adorable and awesome! I ❤️ ❤️ ❤️ this adorable interactive card! TFS! I just finished your blog hop and enjoyed the inspiration. What fun happy cards. Thank you for a chance you win an amazing gift. Love this fun interactive card! Really cute first release! I’m definitely going to order all of your products! They’re so adorable! Congratulations Heffy Doodle! I expect you will be around in this industry for a long time and I am happy to be taking part in this hop. I am loving what I see and look forward to what you design next. Thank you so much for the chance to win such a generous prize, I don’t have the Oxides so its a great opportunity! Congratulations on your new business and new release. Love what I see already. This a great Blog Hop, some really clever cards, this one from Snow is just fabulous! Hello from BC, Canada! Congratulations on your new start-up company Wishing you all the best. I adore your elephant stamp set. The chance to win Distress Oxide Inks is amazing. I haven’t played with them as the CDN$ is so low & the US$ exchange is so high… Thanks for the chance to win. Congratulations on your startup! Awesome hop! Fantastic creations! Ready for doodles of fun! Very cute card! Hello from Colorado, USA. Congrats on this new adventure! The world needs more places to spread creativity and surely Heffy Doodle will be a major part in doing just that! Love this release! Congratulations on a great start! I can’t wait to play with the stamps! The card is really cute. You need a how-to video on it. The card is so darn cute. Love it! I love the stamps. Can’t wait to make a card with one of them. Good luck with your new business!! I love the way all the things float around the cute little guy! CONGRATULATIONS on your new line of stamps I can’t wait to see all your creative new images. CONGRATS!!!! So looking forward to all the stamps and dies to come. Love these sweet stamps and sentiments. It is always great to see new stamp companies and their own artistic twists. I cant get over how cute the Alligator is! I am excited to see what you create next. So cute! Congratulations on your new adventure!! Oh so many projects and wonderful ideas with these cute cute cute stamps! VERY Excited! Super cute!!!! Love the ideas!! So cute! I am loving that interactive feature on the card. Congrats on your new company!!! Clever card. Congrats, and good luck! I love these stamps! I want to Watercolor or use Copics on all the cute animals! Congratulations on your new company!! May you be very successful. I am in love with your stamps can’t wait until they are available for purchase. Love the spinning craft supplies. Can’t wait to get my stamps, they are all so cute! Congratulations! What an amazing start for your business! Adorable spinner. Congratulations on your new business, I wish you the best of luck. I just finished viewing all the posts and left comments. Had to do this over a period of time cause it took so long to see all the fun stuff. You have picked a great group of artists to demo your stamps. I hope I didn’t miss anyone. Anyway, I’m all in. Can’t wait to get my own set of stamps. Thanks for sharing. I supported your kickstarter project and published on my facebook page – for other to join. Anyway – your products seems awesome! Congratulations on your great success with the kickstarter. Love your stamps. Wow!!! Your new stamp sets are really amazing!!! Excited to see all your new stamp sets. Lovely card by Snow. Oh I just can’t choose which stamps to buy!Which 3 are you favorite? What 3 stamps would you choose to get? The stamps are amazing! I wish you the very best in this venture and may you become very successful. I’m soooo happy for heffy doodle!! You will be an awesome addition to this great community. So proud of you Lesley! Your stamps are just too adorable! So excited to be able to use your doodles on my cards! My new hobby with you Heffy Doodle. I’m so excited for your new stamps! They are all so cute! Just happened by this through another bog! Cute, cute, cute stamps! Can’t wait to see inspiration on the blog hop! Congratulations on your adventure with Heffy Doodle! Such cute stamps and dies!!! I LOVE the card from Snow, How CREATIVE !!! Your stamps are so ADORABLE. It is so cool to see a new company come into the cardmaking world, very exciting !! I wish you great success and looking at your products I think you are going to do AMAZING !!!! Congratulations on your new company. I love the stamp and dies. The elephant is adorable. Those stamps are so cute! I want all of them – now to see if I can get my budget to agree to it..! Good luck with the business. The card is ADORABLE. Congratulations on your adventure with Heffy Doodle! Such cute stamps and dies! Loved the card. Fabulous stamps. Really cute and can’t wait to be able to purchase them. The elephants are my favourite. Good luck in your new venture. WOW! I absolutely LOVE these sweet little stamp sets! Congrats on your new adventure and I can’t wait to get an order in with you! Wishing you all the best for your new adventure! They sure look fun, super fun! What cute designs! I just supported you on Kickstarter!! Love the lions and treats. Good luck Heffy Doodle. Welcome to the stamping world! Your stamps are super cute! Love this card, think the little bears are gorgeous, the spinner is a great idea too. Love it. Glad to find out about Heffydoodle! I’m backer #222!